Four spacious and distinctive rooms each present their own comfort and charm... making it hard to choose which one to stay in! Each room is keyed and has a fully equipped ensuite bath, air conditioning, cable TV, telephone, tea, coffee, and access to a guest refrigerator. All beds feature pillow top comfort. We are a smoke-free environment. Enjoy free Internet access from anywhere within the house. in the original master bedroom. Graced with an Italian marble fireplace, queen size bed and ensuite bath, it also has a convenient, connected sitting room with a single pullout sofa. This luxurious suite is as splendid today as it was then, tastefully decorated to create an ambience of comfort and elegance. walls and ceilings in the Luscombe Room. The luxurious queen size bed plus single pullout sofa will accommodate guests preferring separate beds. 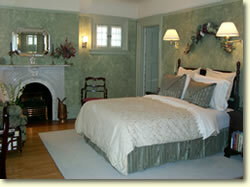 This lovely room also has its own ensuite bath. 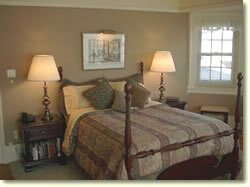 The white wicker furniture, comfy queen bed, and ensuite bath invite you to relax and unwind from your busy day. We accept Visa, Master Card, American Express and Interac. If you wish to bring children please call us. Extra guests (beyond 2) are $20 per person per night. 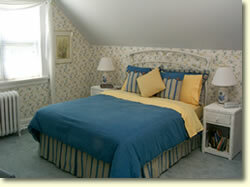 $10 discount per night for stays of 3 days or more. 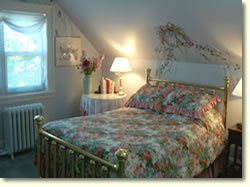 All room rates are subject to applicable taxes. A credit card will hold your reservation. There are no penalties for cancellation of reservations provided you notify us at least 72 hours before your scheduled date of arrival.